It’s that time of year again, when all the genre fiends of Toronto come out in droves to pack one theater for two screenings an evening – and attempt to not catch a cold. Yes, it’s the After Dark Film Festival! The opening Gala scheduled for this year was We Are What We Are – Jim Mickle‘s remake of the Mexican film of the same name from three years ago. Mickle is a well-known name around the festival, as his own Mulberry Street was also a Gala in 2008. Mickle’s We Are What We Are concerns the Parker family, who live their lives with one foot behind closed doors and the other planted within the small upstate New York community they reside in. That is to say, they’re not the kind of horror movie family exaggeratedly engulfed in secrecy – to the other characters residing in this town, the Parker family are quiet and mostly unassuming. Frank Parker (Bill Sage) is the over-bearing father, who fixes watches and runs a local trailer park while his wife Emma Parker (Kassie DePaiva) tends to the house. When Emma runs to the local store for supplies as an immense rainstorm approaches, she suffers what appears to be a stroke – fatally hitting her head on a pipe as she collapses to the ground. This leaves their daughters Iris and Rose Parker (Ambyr Childers & Julia Garner) in charge of youngest child Rory Parker (Jack Gore), as well as some more ritualistic elements of the family’s responsibilities – despite having reservations about the situation. Meanwhile, the rainstorm has unearthed some seemingly human remains – and they happen to have been found downstream from the Parker residence. This sets up We Are What We Are to function on any number of fascinating and engrossing levels. Rose and Iris have been saddled with tasks that clearly exist far outside of their comfort zone, and are struggling with their own nature versus nurture situation. 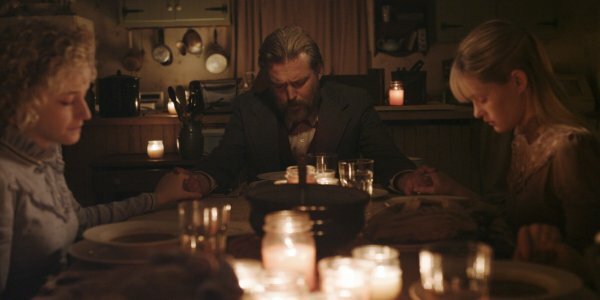 It’s revealed fairly early that indeed the Parker family have nurtured a taste for human flesh, passed down through generations and distilled in a journal – which the family treats much like their own religious text. Despite this, with the passing of their mother, Rose and Iris desire to be normal young women instead of continuing the family legacy of cannibalism. But this never gets fully explored – rather the film has their characters toss off a line or two of dialogue about their want to detach themselves – and so, when the time finally comes for decision making, it feels a little emotionally unearned. On top of everything, the locals – specifically Michael Parks as Doc Barrow – have taken notice of the bones and are starting to piece together the puzzle. This is another element of We Are What We Are that could have proven to be a driving force of the plot, yet Doc isn’t given any real procedural style investigation work until almost two thirds into the film. When he does finally sit down to inspect the bones, it feels like a revelation – genuine interest rears its head. Despite fantastic performances straight across the board, dialogue in the early goings of the film can feel slightly stilted or underwritten – adding to the uneven feeling that permeates throughout. Yet again, when Deputy Anders (Wyatt Russel) arrives at the Parker’s doorstep as Iris’ love interest, all of a sudden the characters are speaking like real, believable people and the film gains momentum. Visually, the film is gorgeously lensed and takes full advantage of the rain-soaked location (or just the location, since director Jim Mickle spoke of the lengths the crew had to go to in order to artificially create much of the rain that appears so often throughout the picture). Nick Damici and Jim Mickle’s script works up considerable atmosphere in the early moments, but then relies too heavily on the visuals and sense of dread alone for a good stretch of running time – forgetting to let us latch on to the real meat of the story. What’s most unfortunate about We Are What We Are is how all the elements are in place to make for an interesting remake. Much has been made about how the filmmakers blazed their own trail here – swapping all of the genders and moving the film to New York, among other tweaks to the original film. Adding in the procedural sub-plot and attempting subtle criticism and commentary (Frank’s god-fearing, cult-like blind devotion to the family’s past is an obvious nod to North American organized religion) sounds like a perfect route to take on paper. But nothing really hangs together quite like you expect – or want – it to. Often times, films with un-capitalized potential like this inspire the most vehement reactions, but We Are What We Are simply is what it is: an admirably low-key, boldly beautiful and well-acted film that just isn’t sure what to focus on, so it splits the difference too evenly with ultimately disappointing results.